Our world is filled with distractions, both external and internal. What pulls your focus away from the other person and their message? 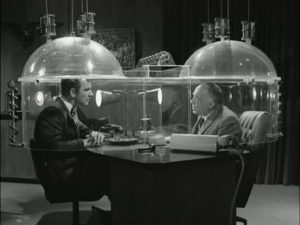 If you’re old enough to remember the ‘60’s TV show, “Get Smart”, you’ll remember the “cone of silence”. The cone would descend over two people who needed to privately discuss top-secret information. I know, the cone never worked and actually prevented them from hearing each other, but you get the point. When someone is talking to you, try lowering your own cone of silence to block out everything going on around you. • Your physical comfort – you’re hungry, thirsty, cold, hot, or tired. • Your psychological barriers – you’re bored or daydreaming, or their topic triggers thoughts of your own past experiences. • External interruptions – phone calls or notifications, outside noise or activity, visitors. Listening takes energy and focus. You must first decide to listen, then work to eliminate all distractions. Stop multitasking, maintain eye contact (where the eyes go the ears will follow) and lower that cone! Every message we hear is run through our personal filters, which can include our opinions of the person or issue, our past experiences, prejudices about the idea, and personal agendas. They’re stored in our subconscious and prevent us from being truly present. These biases can distort the message and even trigger our emotions. Develop an awareness of your filters and don’t let them get in the way of true understanding. Take responsibility for interpretation. Words mean different things to different people, so you might need to ask for definitions (“What did they mean by ‘in the running?’”. “Are you talking about the A Project or B Project?”). Ask clarifying questions if you’re confused (“Are you referring to…?”, “I think I missed something, can you go back to…”). Most people don’t add enough specifics when they speak, so instead of making assumptions and creating a disconnect, make it your job to help them communicate more clearly before you respond. A few summaries as you listen will not only help confirm your understanding of their content, but allow you to also figure out their intent. “So what you’re saying is…”, “So you’re suggesting…, is that correct”? You’re floating ideas for confirmation and direction—and what they answer will help you formulate your next question or comment. Your summaries and questions can also help them figure out what’s missing, what’s possible, and what isn’t. As you can see, effective listening often requires you to do some talking, along with focusing like a laser. Incorporate the three techniques above to their content—and your content will be better as a result.